What is Real Draw Pro by Mediachance? Most computer users have a need to edit or create a graphic image sooner or later. Whether this be a screenshot of a computer activity, the adjustment of a digital or scanned photo, web buttons, creating a logo or banner, making digital scrapbook embellishments, or indeed any other graphic use, an appropriate software program will be required eventually. This can then become a very complex and difficult situation for anyone unfamiliar with the massive variety of program choices available. Programs such as Adobe "Photoshop", or Corels "Paint Shop Pro" will often be mentioned as a suitable choice of program to purchase. These two are excellent programs, and along with several others, are excellent graphic tools to have on your computer. 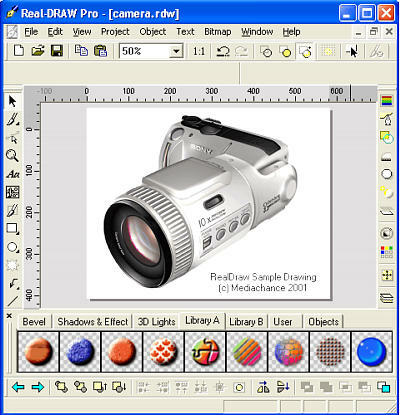 ...But they are not as easy to use as "RealDrawPro" by MediaChance, and are more than double RealDraws' price. "...Real-DRAW is a very powerful and innovative combination of Vector, 3D and Bitmap editing. It has the editing flexibility of vector graphics with the natural and organic feel of bitmap textures, rendered 3D surfaces, shadows, lights, transparencies and bevels. All is WYSIWYG and created in real time. It takes the very best ideas from all known creative methods and logically combines them..." (RealDraw pdf manual). There is much more - Real-DRAW is one of the most versatile graphics programs and is very inexpensive. You can create images from painted art to photo-realistic 3D rendering, or anything in between. It is particularly good at adjusting Photographs, and at preparing images for further screen usage. This includes images for Internet or E-Mail use, images requiring a reduction in size, (either physical or file sizing), and images that may need an adjustment in colour or sharpness. Or, you could just simply draw something! It's an excellent tool for Crafters, for school projects, for creating artwork to use on Celebration Cards, Work Documents and Presentations, or in Electronic or Web Publishing. You can be very creative as everything is editable at any time, you don't have to recreate the graphics over and over again. Almost anyone could become a graphic genius with this program. All of the above can be further explained within the Mediachance Software RealDraw web site, or may be found within RealDraws' own Help file. Further Tips and Tricks for using RealDraw can be found around this BushArts site, along with many downloadable extras, or consult with other users for further assistance, at the Real Draw Forums. Although Real Draw was not designed to replace any other program, - rather work alongside your own existing tools, many users find that it will do virtually every graphic task the others can, but do many faster, and via a much simpler method. This does not mean that it has only simple functions, - even skilled web designers and experienced graphic artists are constantly re-discovering some of the many "extra" features that put many far more expensive programs to shame. A Fully functional trial version is freely available to download and test for 30 Days, after which we are certain even loyal fans of competitors programs' will recognize the extreme value. There are also many of the Computer Graphics industrys' "Top Guns" that quietly list RealDraw amongst their tools of choice. It has been reviewed by many, and always with a very high rating. For background info... Mediachance is a one man operation based in Canada, and BushArts.com are not affiliated with Mediachance.